Good combination of open and wooded. Elevation change makes it play longer than measured. 9 hole tone course - The Outback - on site also. I-40 to Winston-Salem, Exit 188, Hwy 421 north 20 miles to Yadkinville, exit Unifi Industrial Park Rd., take left and follow signs to park. From Charlotte; I-77 to 421 south, exit Unifi Industrial Park Rd., take right. Overall: Good course right off the highway that has a little bit of everything. This is located in a large complex with soccer fields and a pool, and plays through some open fields and woods. Navigation/Design: Could use some more signs telling you where to go, but the layout is generally obvious. The front and back nine are each half in the woods, half out, which dispels monotony. Concrete pads are in decent shape and fairways are well maintained. 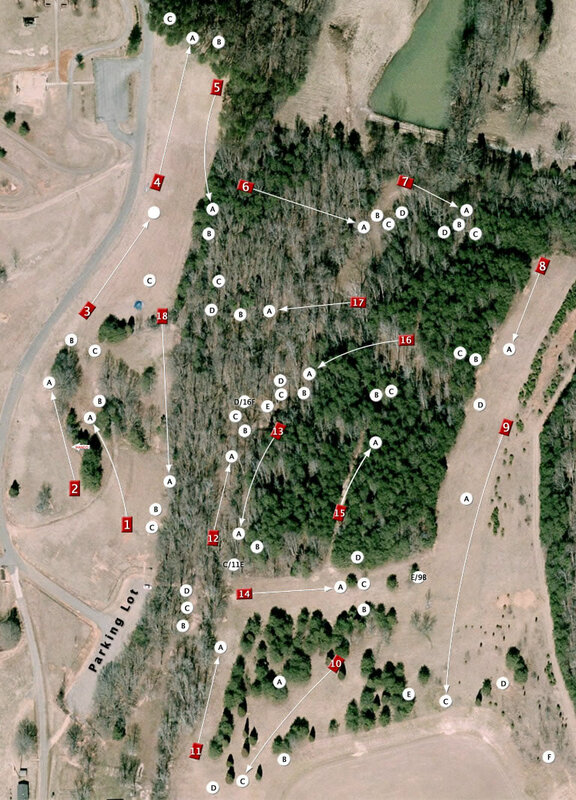 Challenge: The open holes will put you at par if you're decently accurate at distance, but the woods pack some spice. A few blind doglegs make you cross your fingers and hope! Summary: Good course overall, that could use some signage (and some trash picked up, but what course doesn't?). No spectacular holes (maybe 9? ), but consistency is key here. If you're headed up 421, don't miss it! Overall good course with varied terrain - some wide open shots & others through the woods. Tee pads are gravel, but well marked. Course could benefit from better marking as far as where to find next tee or where exactly the hole is located. Overall an enjoyable course to play.